Chelsea defender David Luiz believes cross-city rivals Arsenal have completed one of the signings of the summer in the form of Alexandre Lacazette. The France international joined the Gunners from Lyon earlier this month after they finalised a £52.3m deal with the Ligue 1 outfit. Luiz spent two seasons away at Paris Saint-Germain between 2014 and 2016 where he came face-to-face with Lacazette, and the centre-back admits that it was always tough handling the 25-year-old striker. The agent of Chelsea goalkeeper Thibaut Courtois has confirmed that he is updating his clients’ status with Champions League holders Real Madrid. The Belgium international made a couple of key saves during the course of last season as the Blues clinched their fifth Premier League title. Courtois is currently contracted to the west London club until the summer of 2019, and he is said to have stalled on a proposed extension as he looks to earn a significant rise on his current wages. Eden Hazard has a contract with Chelsea which extends until 2020 but the Belgium midfielder has recently been linked with various clubs as there are many managers interested in securing the services of the Premier League Player of the Year for 2014. Real Madrid is one of the main clubs that has been rumored to sign Eden Hazard but unfortunately for the Spanish outfit, Hazard recently stated that he considers Chelsea to be part of his family and does not have any real interest in leaving. 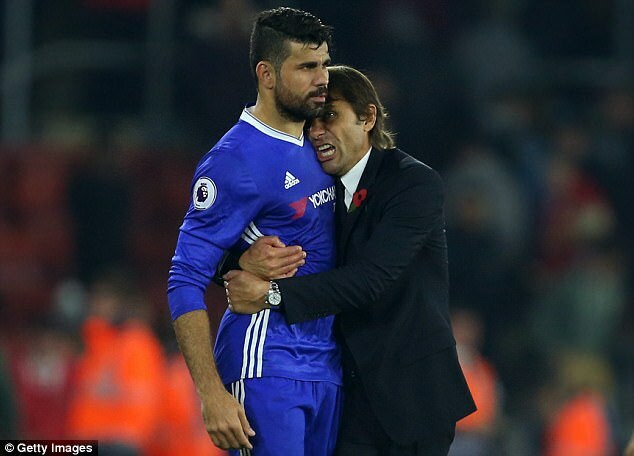 Spain international Diego Costa has insisted that his Chelsea teammates want him to stay put Stamford Bridge despite Antonio Conte’s desire to offload his services in the summer transfer window. The Brazilian-born striker revealed last week that he could be packing his bags away from Stamford Bridge after he received a text message from Conte stating that he is not on the Italian’s plans for the 2017/18 season. As a result, the 28-year-old is looking at short-term options with Atletico Madrid unlikely to buy him outright due to their ongoing transfer ban. Embattled Arsenal manager Arsene Wenger opines that Premier League leaders Chelsea had an advantage over the rest of the top teams due to lack of continental football action. The French coach is worried about the messages that league winners send out ashe feels Chelsea and Leicester City did not take the initiative in games.